Developing a mobile app from a business perspective is one thing- Next, there is the challenge of marketing it and making it recognized as an exceptional application from the millions of mobile applications that are as well competing in the market. The best way to deal with this is by embracing and implementing a clever plan which integrates powerful Search Engine Optimization aka SEO and App Store Optimization aka ASO techniques for better results. Taking SEO into account, it enhances your website to be more prominent in the search engines. ASO operates on a similar logic except that it is specifically for App stores which feature Mobile applications. Combining both the powerhouses for a single ambitious goal will showcase their top potential in terms of performance. Based on the most reliable sources, Google still occupies a prominent role when it comes to making a mobile app visible in terms of reach. Thereby not adhering to all its standards and optimizing your site is not a good idea as they will prove detrimental with respect to rankings, traffic, brand visibility and the such. Ultimately the best shot to brand your mobile app to the precise user base is wasted. Coming to the App Stores they can also be signified as a form of Search Engine. This as well represents how Mobile App ASO is represented as an equivalent of SEO when it comes to Mobile Applications. If your application ranking is very much higher in the app store, the visibility enhances and so does its popularity. Seeing that the boundary separating the desktop domain from that of the mobile world is getting more and more dissolved, both web marketing and application marketing are integrating together. The main goal from the perspective of the marketing team is to offer the best user experience irrespective of whether it is for a website or a mobile application. As aforementioned, the visitors become more involved with it. That ultimately shows why ASO and SEO are important for a robust app branding venture. 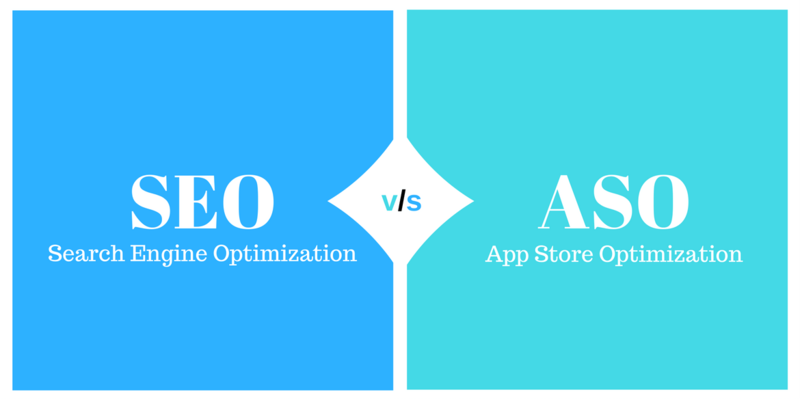 It is suggested to embrace both SEO and ASO as not two separate entities if your aim is to succeed effectively in mobile app branding and succeed it attracting prospects. This is because the underlying concept of Organic Search Optimization is what that ultimately defines how your digital presence will be and thereby it is a vital constituent for the entity that is mobile app ASO. the title and the related URL as well. c. Producing app ratings and user reviews. d. Implementation of mobile app deep linking. e. Indexation of the mobile app in Google. f. Click Through Rate technique. A typical fact which mobile app developers usually do is overlooking and underemphasizing the potential for a powerful and quality website. The present timeline sees a brand’s website as its manifestation in the highly vying digital domain. The website serves as the knowledge point to get considerable insight into the mobile application of yours before they consider to download it. Thereby the website has to be very much informative of the mobile app of yours and should offer a glimpse of the user experience which it will provide. As an end result, the visitors are converted into potential users who will download your application. Creating a blog comprising of specific enthralling stuff also serves to enhance your mobile app’s reach and visibility. Ultimately the online traffic enhances and so does the download statistics. a. Meta Title: Longer titles will be cut short when it goes through the SERPs. Thereby the meta title has to be very short yet catchy. It should also contain the important keywords relevant to you. b. Keying the meta description as much as basic as possible is good. Also, include the plus points to enthrall the people to finally download the app. Updating the product page implies the specific details have to be revamped as well. c. App reviews signify the popularity of your app and what it has to offer in terms of quality. Your company reputation is augmented as a result. d. When it comes to app page optimization when taking the keywords into account, the titles, the descriptions, and the related details required to be keyed keeping your target audience in mind. The info provided is what that decides if people will download the application. The apps which occupy the top slot when it comes to ranking in the App stores have a common principle where they are enhanced on a regular basis. Enhancement includes technological changes, feature updates or taking user feedback into account and acting accordingly. This gains you a loyal user base following. Seeing the dedication you put on a consistent basis where you are developing app enhancements taking into account whatever the userbase feels will surely enhance your rankings in the app stores and places you in a nice special position which your rivals are not a part of. From this article, you can understand how important it is to merge both the techniques of SEO and ASO even though they are actually two separate entities. The unification will surely enhance your brand visibility. Thereby you can understand how you can enhance your rankings in both the search engines and the app stores while at the same time increasing the digital traffic with regards to your mobile application as that is what you aim to accomplish in the end.